The care of your health is a partnership between yourself and the Primary Health Care Team. The success of the partnership depends on an understanding of each other’s needs and co-operation between us. 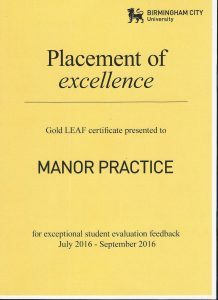 Manor Practice has achieved a Gold Leaf award from Birmingham University. This is awarded to us in recognition of exceptional student evaluation feedback.